Look at him….he’s totally trying to figure it out. He’s not even going to try it. And well, as always, the rule in our house is you have to at least try it, and with a good attitude, or it doesn’t count. I’m fortunate enough that he’s not afraid to admit when he’s loves something he didn’t think he would. But, this was not the case today, and fortunately for my daughter, this just meant more for her. She’s been asking for this snack but lately, and we’ve just been so busy we haven’t had the time. Anyway, she was very happy when she got home today and this was waiting for her. Fill pan with just enough water to cover the bottom. Add lemon juice, garlic, and celtic sea salt to the water and bring to a simmer. In the meantime prepare the artichokes. Wash artichokes under cold water. Using a heavy stainless steel knife, cut off the stems close to the base. Pull off the lower petals that are small and tough. Cut off the top inch of the artichoke and rub with half a lemon to preserve the green color. Then, trim the thorny tips of the petals with kitchen shears. Place the artichokes in the steaming liquid, bottom up. Cover and simmer for about 25-40 minutes. 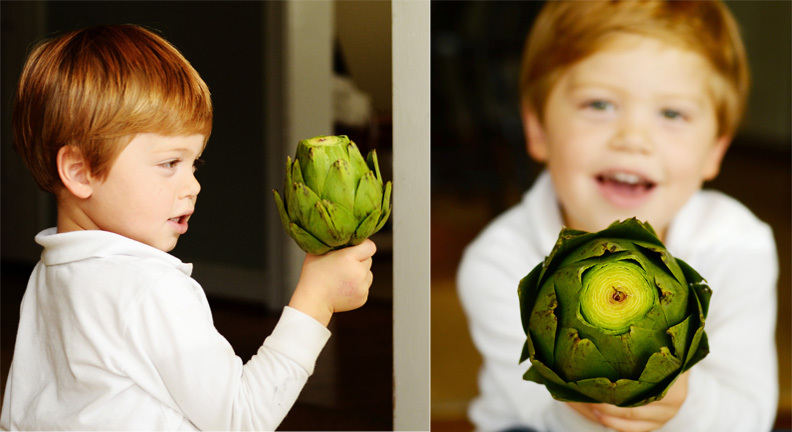 The artichokes are done when a knife is inserted into the base and there is no resistance. To eat, pull off a leaf and scrape the meat off the tender end with your front teeth. Dip the ends of the leaves in melted kerrygold butter (and lemon juice, if desired). When you reach the center cone of purple prickly leaves, remove it. This is the choke that protects the heart. Now, scrape away the thistle fuzz covering the artichoke heart. The heart is the meatiest part of the artichoke. Steamed artichokes may be served hot or cold. Enjoy!